Get hands-on with our living tide pools at the Preuss Tide Pool Plaza. Aquarium volunteers will help you get up close and personal with sea stars, sea anemones, hermit crabs, sea cucumbers, lobsters, and other organisms that call the the rocky intertidal zone home. 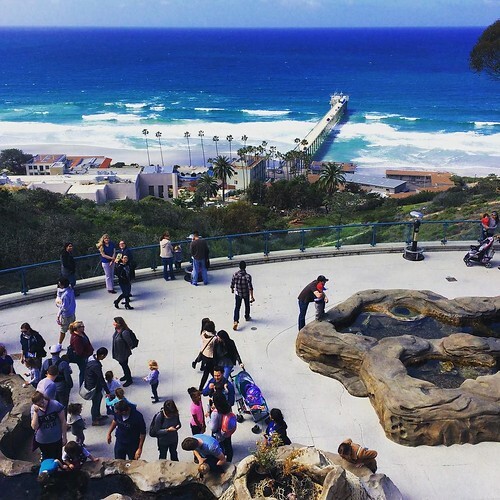 Tide Pool Plaza is also the location of some of the most spectacular ocean views in San Diego. Overlooking La Jolla and the Pacific Ocean, this stunning outdoor plaza is a great place for guests to enjoy the coastal breeze and take in panoramic ocean views. What’s in a name? Tide pools gained their name because of their tidal dependence. These shallow pools are only found along the ocean’s edge where rocks can trap water as the tide goes down. These pools created by rising and lowering tides are dynamic habitats for many ocean organisms! Tide pool organisms truly know how to survive “between a rock and a hard place.” At high tide, these rocky pools are covered with cool ocean water, but at low tide, inhabitants must survive bright baking sunlight, little to no water coverage, and exposure to land predators. You can learn more about all of the amazing adaptations these organisms have at Tide Pool Plaza. Birch Aquarium’s tide pools are man-made, yet are based on local tide pools. San Diego’s coastline is dotted with rocky zones that are just right for tide pools. Looking to become a tide pool expert? Join Birch Aquarium on a guided Tidepooling Adventure! These family friendly excursions meet at the beach during winter and early spring when tides are best for exploration.